The second in a series of polling by Survation for the Daily Record ahead of the 2016 Scottish Parliament election sees very little change from January as the SNP continue to dominate the political landscape in Scotland. 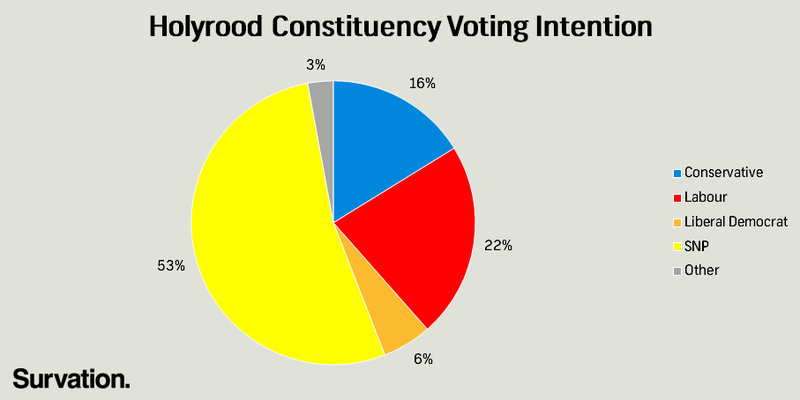 The Labour Party still remain more than 30 points behind the SNP in the constituency voting intention, whilst the Conservatives have not made any noticeable progress despite some commentators proposing that the Conservatives will be aiming for a “serious Holyrood campaign”. The SNP also continue to outperform the other parties in the List voting intention, 27 points ahead of Labour, the next closest party. The List vote also continues to show favourable figures for the Scottish Greens, keeping them on 9% and further out-polling the Liberal Democrats, whilst UKIP remain relatively steady as an EU Referendum draws ever closer. Respondents were also asked to what extent they feel favourably or unfavourably towards a number of UK or Scottish political leaders. 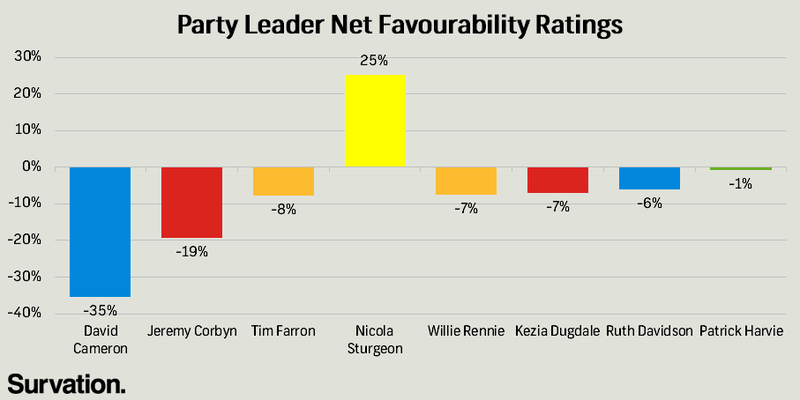 Continuing the theme from last month’s poll, SNP leader Nicola Sturgeon was the only leader with a positive net favourability rating on +25, with the next ‘best’ rating again coming from the Co-convenor of the Scottish Green Party, Patrick Harvie (-1%). Westminster leaders once again tended to have worse favourability ratings than their Holyrood counterparts, with David Cameron (-35%) and Jeremy Corbyn (-19%) doing significantly worse than Ruth Davidson (-6%) or Kezia Dugdale (-7%). Cameron and Corbyn actually suffered drops in their ratings by 4 and 3 points respectively, whilst Dugdale’s rating improved by 2. 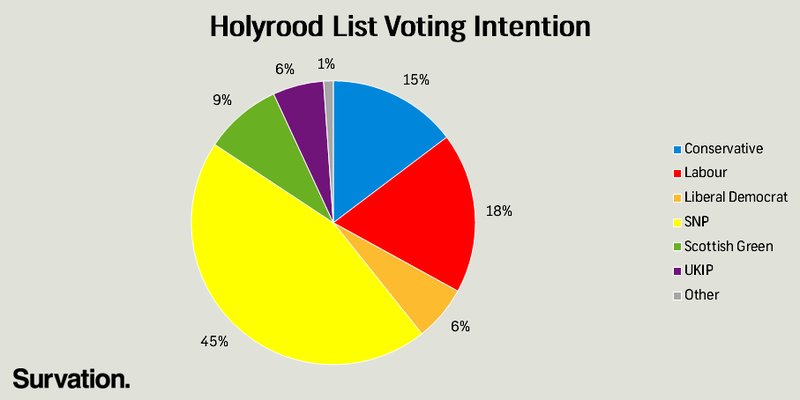 Interestingly, all of the Holyrood politicians had an improvement in the number of Scots who had heard of them, a trend which should continue as the Holyrood election draws closer. Dugdale in particular improved in this area, with 5% fewer Scots saying that they hadn’t heard of her compared to January, possibly contributing to her improved favourability rating. Finally, we asked respondents about their level of support or opposition to a proposed 1p rise in income tax rates across all bands before testing whether the policy, originally proposed by Labour, would help or hinder Labour’s electoral chances. We found that the proposal had moderate support, with 42% stating that they at least somewhat supported the policy compared to just under a third (31%) who opposed it. The 1% income tax rise, however, which Labour say they would offset by offering low-earners a £100 income-boost, did not appear to drastically change the likelihood of Scots voting Labour at the upcoming Holyrood elections; whilst 22% said that the policy would make them more likely to vote Labour, a fifth (20%) said it made them less likely, with half (50%) saying that it would make no difference to their vote. 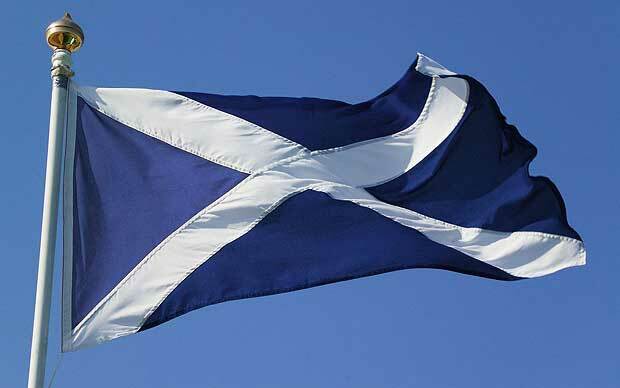 Survation interviewed 1,006 Scottish adults aged 16+ between 11th – 16th February 2016. Full tables are available here.